As a Coach, I feel strongly that the best way to be successful in reaching our dreams and visions for a healthier, energetic and satisfied life is to make S.M.A.R.T. Goals. 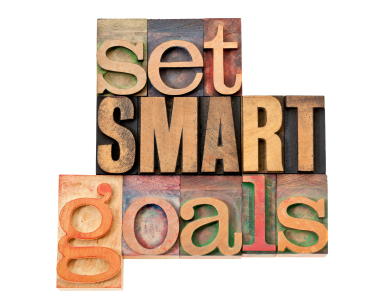 During my Wellcoaches Wellness/Fitness Coach Training, one of the most important aspect of working with a new client was explaining the concept of setting S.M.A.R.T. goals. Many times, I would find my clients over-committing, over-estimating and over-confident about what they could achieve in a week’s time. I loved the enthusiasm and readiness to “get going.” However, I knew that creating an experience of success every week was much more important than setting huge, life-changing goals. Even when going to the gym once for 15 minutes and eating 2 healthy breakfasts a week seems “not enough’ or “wimpy,” I know this is key to creating a habit of long-term success by setting smaller l00% achievable goals . .
S-Specific, simply written and clearly define what you are going to do. M-Measurable, you should be able to track your goal. R-Realistic, so that success in the short term generates energy for the longer term. T-Time-specific, so that there is a time line for finishing the goal. Happy S.M.A.R.T. 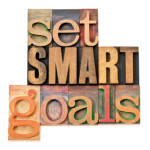 Goal Setting to you!